Village Blacksmith IBA, a locally brewed beer from Calgary's Village Brewery, is infused with potent and bitter hops and comes together with all-natural ingredients to make the perfect soap for removing dirt, soot and grime. 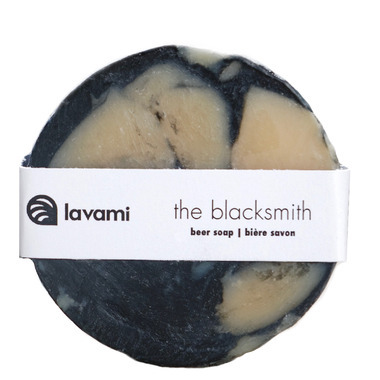 With added charcoal, pine, anise, clove and orange, Lavami Blacksmith Soap is sure to raise the spirits as well as give your skin a thorough and refreshing cleansing. All of Lavami hand and body Soaps are formulated to be gentle, moisturizing, and to hold up well in the shower while creating a luxurious lather. Part of Lavami’s philosophy is that their ingredients must be high quality, non-GMO and sustainable, while supporting different communities and producers globally, but they also ensure that as many as possible are local. They believe that sourcing local ingredients helps our communities and economy, and builds on the idea of being Made in Canada. Recommendation: Store on draining soap dish and outside of shower to extend life of bar. Ingredients: Olive oil, coconut oil, palm oil, lye, shea butter, sweet orange, clove, anise and scotch pine essential oils, activated charcoal, bentonite clay.